Greetings campers and hope this finds you well and staying warm! Don’t worry, the days are getting longer and spring will be here before we know it. In the meantime though the snow is getting deeper out at the lake so as of tonight (Tues. Feb. 26th at 6pm) there is a new lock on the gate. The snow is too deep to drive through the campground now so if/when visiting in the coming weeks you’ll need to park outside gate and walk in. Thank you and we’ll let you know here on the website/enews when you’ll be able to drive in again. This entry was posted on February 26, 2019, in Koocanusa, Koocanusa Campsite. Hope this finds you well and that the smoke has cleared in your part of the world like it has here at Koocanusa. We are very grateful for last Sunday night’s rain helping to clear the air and assist in fighting forest fires in our region. Sorry this update has been a long time in coming and we hope to see you back here at the lake for a sunny September long weekend! 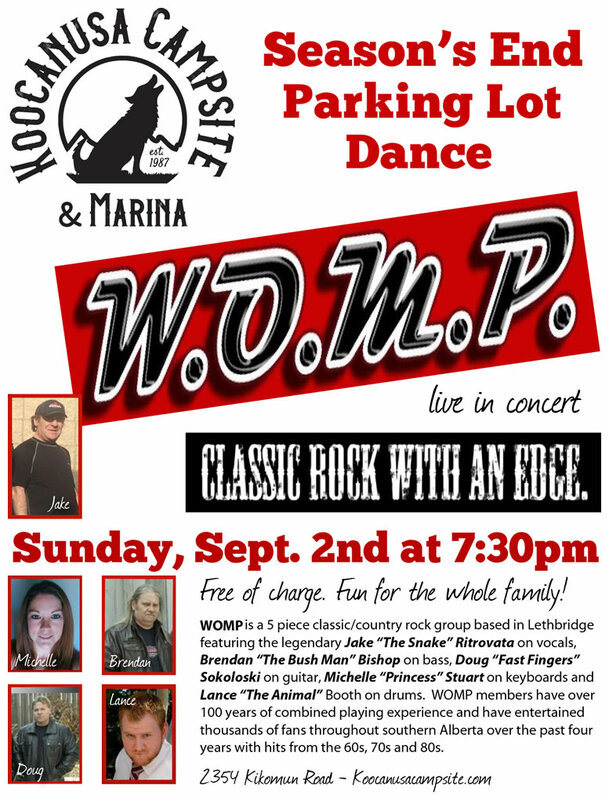 Firstly, please join us for our annual Season’s End Party/Parking Lot Dance taking place this Sunday, Sept. 2nd at 7:30pm. We are pleased to have our friends WOMP from Lethbridge back to provide live music again. Click here for a bigger version of poster and more info, this event is free and fun for the whole family! The band also invites campers who play music to come join/jam with them on stage. Check out their facebook page and/or contact them here. yes, this has been/is a horrible summer for Wasps(!) Please keep in mind our staff who collect garbage around the campground. If/when disposing of your wasp traps, ideally all wasps are dead and in any case, please tie up in a grocery/garbage bag so they don’t escape. Please also make sure all food waste is contained in sealed garbage bags to reduce attractants for wasps. Our Store is open 9am – 9pm daily until this Sunday, Sept. 2nd. Afterwards, we’ll be open 9am – 7pm unless otherwise noted until we close on Sunday, Sept. 16th. Last Day for Water & Garbage is Monday, Sept. 17th. That should be it for now. We hope you’ve had a great summer and look forward to seeing you at the lake this long weekend hopefully, enjoy! This entry was posted on August 30, 2018, in Koocanusa, Koocanusa Campsite, Koocanusa General Store, Koocanusa Marina, Lake Koocanusa. Hope you’re having a good weekend here at the lake or wherever you might be. Just a quick note to remind you (our campers) to come sign for and pick up your new gate keys at your earliest convenience. The new lock will be going on the gate the evening of next Sunday, June 17th. After that time we ask you to return your old/existing gate keys to the store on your next visit to the campground ideally. That’s all the updates for now. Keep an eye here on our website and the boards down at the store for the latest info on upcoming events like Canada Day. This entry was posted on June 9, 2018, in Koocanusa, Koocanusa Campsite, Koocanusa General Store, Koocanusa Marina, Lake Koocanusa. Hope this finds you well and continuing to enjoy spring in your part of the world. We just wanted to let you know the good news that the water will be turned on throughout the campground this coming Friday, April 19th in time for the long weekend. Wishing you a Happy Easter weekend with family and friends here in the South Country or wherever you might be. This entry was posted on April 17, 2019, in Koocanusa, Koocanusa Campsite, Koocanusa Marina, Lake Koocanusa. This entry was posted on April 8, 2019, in Koocanusa, Koocanusa Campsite, Koocanusa General Store, Koocanusa Marina, Lake Koocanusa.